Fresh off of his rookie season with the Kansas City Royals, David Cone went to the Puerto Rican Winter League (Liga de Béisbol Profesional Roberto Clemente) to further hone his skills. By the end of the winter season, Cone was a champion, saving Game 6 of the Caribbean Series for Caguas en route to their title. 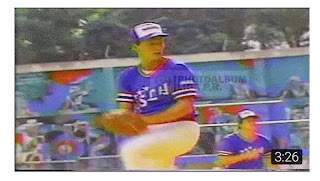 Joe Towers (@joetowerscards) recently posted footage of Cone pitching in the LBPPR All-Star game, flashing the eventual brilliance that led him to five World Series championships and the 1994 American League Cy Young Award. Only a few short months after this appearance, the Royals traded Cone to the New York Mets, which put him right in the middle of the baseball spotlight for the incumbent World Series champs. Click here to read more about David Cone and his later brush with baseball immortality.